AVIXA Diversity Council and NSCA Ignite program among the initiatives AV industry needs to help people of all backgrounds learn more about it. There are certain times when you know before you post something that it will generate conversation, and diversity is certainly one of those topics that trigger strong reactions from all sides of the issue. I wrote about the launch of the AVIXA Diversity Council shortly after the group’s first meeting during InfoComm 2018 and reported some of the details about the group aimed at educating people of all background about the AV industry and the roles they can play within it. Plenty of AVIXA members and #AVTweeps shared the write-up on social media and talked about the importance of this initiative, but others have questioned the need for it. Diversity in the AV industry: based on facts or just ‘labels’? It’s not surprising this issue has generated so many strong opinions, but the upshot is people are talking about diversity in AV openly, and that’s a great first step in my mind. 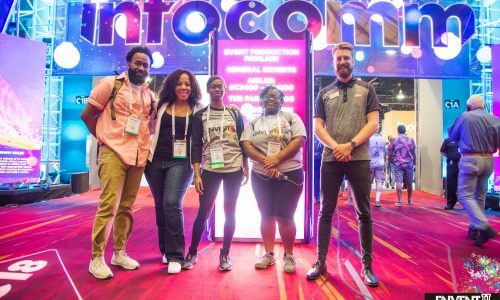 Torruella promises the AVIXA Diversity Council will become more well-known between now and InfoComm 2019 in Orlando and Eberle Boyer expects the council to meet monthly between now and then. The AVIXA Diversity Council and efforts related to adding more young people to the AV industry, including AVIXA’s grant program and NSCA’s Ignite initiative are solving a problem CEOs in this industry have been kvetching for a while: a lack of talent in the industry to take the reins as those proverbial “old white men” move closer to retirement. I completely understand why people are uncomfortable with change; trust me, I’m the poster boy when it comes to that. But I can’t for the life of me figure out why those in AV wouldn’t want everyone to know more about their industry and why it’s something they might want to consider as a career. Good grief. Our church tech team has people from 14 to 86 black Brown white Unknown, Male and Female. No problem. In face we have fun. Informing people about the industry is great. It is in the interest of these AV companies to want that. I am just not sure it has to be connected to a group focused on “diversity”. Go to the various communities or colleges and inform. Take off the political identifier and go in the name of information and growth in the job market. We can play with words all we want. Whether “diversity” is a “key” or not, the word is now linked to political platforms and I imagine that bringing it into this industry is less beneficial and counter productive. The goal can still be the same. Educate to “all” people, but announcing it, and packaging it in such a way that implies a problem, rather than an opportunity for growth and education is suspicious. Why not approach it in a way of partnership to make sure that everyone knows this industry holds lots of opportunity. In this day and age, with the political climate, I would say that wariness is not completely unreasonable. Again, is this group here to help or cause strife? Again, my problem is in the overtness and public creation of “champions” for the good of the “people”. It seems more like a chance to make a name for themselves then to truly help. It’s funny to read the reactions to this has a black female stage crew, Av Technician in the uk I can count on one hand other black females ie I have meet two. Google employee discovered that 20% of the grads fm univ,. in coding were female. Google was hiring 20% women about what was available. I know a number of black brown and female workers in Film/TV looks like to me they work about as much as anyone else. There are fewer % of them, but this is also a representation of choice. Most of the people I know in the industry hire as man y minority and women crew as they can. Looks to me like being blown up much bigger than any real problem. Great topic! With over 20 years of experience, I have experience more than my fair share of discrimination. As an Black man, I can honestly say that despite having opportunities to work in mid and senior level management positions most of my career in a major US market. Every day was a fight for my job and any mistake was view more critical than other non-ethnic managers. The stress of not being considered equal forced me out of the business. That was 5 years ago and I have moved to a smaller market and when several great opportunities, applied for the job even though I was over qualified and was told I didn’t have the required skills. A couple of those jobs still haven’t hire anyone. Still amazing. I have been in the AV industry for almost 40 years and it has always welcomed diversity. As an industry, diversity isn’t an issue because what we are looking for is talented people, or people who want to learn and work in our industry. FSR is probably one of the most diverse manufacturing companies in the AV world. We never look at a person’s gender or color of their skin, or age when hiring. We look at what they can bring to our company. We have women and men in top spots, and we are about 60% minority (many holding top positions). People are people. Let’s not label people but see them for their talents, their drive, and their skills. And if they are short on all the skills, offering training if they are on board. If you embrace this attitude you will have loyal employees and a successful company. It is troubling to see this synthetic topic of ‘diversity’ thrust upon the A•V•C industry and while none of us have control over what another individual chooses to do — whether decent or indecent, the merits of this dubious language are only slight. Diversity should be the realization of the culture you have AFTER building it through the objective of bringing the most qualified and skilled individuals into your organization — NOT a framework or cage that is built to then force talent inside of. As a culture founded of free people in the United States there should be no desire to police what individuals think — and those who feel compelled to continue to divide citizens across lines of race, gender or any other label designation should seek instead a clearer understanding of basic human decency and whether or not they will embrace the clarity and resolve to practice this value conservatively and with integrity. None of us are entitled to respect because we carry a title or have a senior position in a company… we EARN respect through great dedication & perseverance, proven skills, delivered innovation, and sincere interest in fostering the professional success of our clients and our coworkers. Introducing ‘fairness‘ into the business environment opens the door to a subsidy mindset and awakens the beast of entitlement. This Is nothing more than an insidious and politicized corruption of what should otherwise be proven conservative business practice. It is somewhat ironic that In the world of A•V•C systems development and sales we are building transport mechanisms for content delivery, but we somehow surrender our critical thinking when it comes to the actual quality of messaging within that content. I encourage all practitioners in the world of A•V•C systems to become The Objective Underground and apply conservative critical thinking to the constant barrage of ideologically-driven messaging that assaults our cultural values of individual freedom and equality of opportunity (not outcome) for all. We are better than this and herein lies the messages we must teach our team members to keep our culture strong.